Can you hear me love? Just listen to what I’m saying, can you hear me? Alright.. Dependable Josh Griffiths is the kind of paramedic anyone would love to have care for them in an emergency, he is highly trained and intelligent, and his quick thinking has helped saved countless lives over the years, and his patience and dedication have helped him train and get on well with his paramedic partners. Josh is also funny, good humoured and sensitive, however after everything that has happened to him in his life, although it doesn’t show, he feels things deeply. Josh has had his tragedy in life; he was devoted to his wife, Helen, his daughter and son whom was wheelchair bound with cystic fibrosis – however their lives were cut short in a house fire in S11 E20 – what made it worse was Josh was on call, and arrived at the scene to the devastation. Josh’s first episode, S4 E1, sees just the kind of horrific things he has to witness; in this episode a car has collided with a lorry full of toxic chemical drums on the motorway, and he is at the scene. A policeman dies after falling into a pool of acid. Dealing with relatives is also an important part to the job, which is shown in S5 E10; when Josh is called to a farmhouse to find an elderly patient already dead; but his crazed son is menacing them with a butcher’s knife. Josh, and Lily, have to pretend the patient is still alive, until they can get into the ambulance and speed off. He even has trouble getting patients to hospital, an extreme case in S6 E13, where Josh and Jane have trouble enticing a mentally ill man, who has spilled hot fat onto himself, into the ambulance. In S6 E15, Josh also has to deal with the many casualties after a major plane crash, which puts Holby on red alert. In S7 E2, Josh is off-duty, when he comes across an RTA, in which a young motorcyclist has fallen off his bike. While Josh calls for help, an interfering GP removes the boy’s crash helmet, putting his spinal cord at risk – Josh is furious, confronting the GP, and thinks of telling the boy’s father. In S7 E15, Josh and Jane are busy at Christmas, they call to a house where a wife has stabbed her alcoholic and abusing husband. As they bring him in, a young homeless girl – who Rob earlier discharged – runs infront of the ambulance, causing it to swerve and hit a lamp post. The stabbed man dies, and an upset Jane has whiplash injuries – Josh tries to cheer her up in her cubicle. In S7 E18, it’s Jane who comforts Josh, when he is injured, after a mentally ill man who has tried to kill himself, tries to strangle Josh when he arrives at the scene. Josh’s wife arrives too, and treats Jane jealously. In S7 E23, two young boys steal a security van not realising it is carrying radioactive isotopes. When they crash, the isotopes are scattered. With Josh and Jane unwittingly contaminated – they are forced to strip and shower in casualty. And in the final episode S7 E24, Josh faces a tough time bringing in casualties after a riot on an estate, which leads to youths arsoning the hospital. In S8 E1, Josh is called out to a major accident of a train crash; there are many casualties, some of whom are trapped in the wreckage, which doesn’t give him an easy time. Nest episode S8 E2, strong winds at Holby lead the staff to face a busy time. A family are involved in an RTA, but hampered by the storm, Josh and Jane are unable to reach the scene in time to save a woman’s life. SHO Karen who was at the scene, takes it out on them, which doesn’t please Josh. After Jane decides to get a job in management, Josh has a new partner, Brian, in S8 E10, but finds it difficult working with him. In S8 E14, Josh is called out to a backpacker, who has been stung in the throat by a bee; he is too ill to be moved and Josh is forced to take instructions via radio from Mike on how to cut a hole in the patient’s windpipe. In S8 E21, Josh faces a busy shift, he and paramedic Lucy, are sent to take an old man back to his flat at the top of a high rise block – he lift is broken, and they are forced to carry him all the way up. They next arrive at the home of an Italian woman who claims that her son has hit his head. Josh finds nothing seriously wrong but takes him to A&E anyway. In casualty, Mike notices the mother is ill herself, with a heart condition. Later a girl, who has injected drugs, is brought in by paramedics Eric and Chris. In the ambulance she becomes hysterical and runs away. Josh and Lucy take a call to an unconscious girl – the runaway drug addict. At Holby she claims that Josh sexually assaulted her. Josh is at first suspended, until she then switches her allegation to Eric; Josh is cleared. In S9, Josh is now a motorcycle paramedic, who provides assistance until the ambulance arrives. In S9 E8 a coal mine tunnel collapses crushing a man’s legs. Josh arrives, and while another man calls for Mines Rescue, another section of the tunnel collapses, trapping Josh and the patient, Duncan, for three hours. 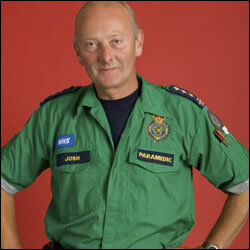 Josh is moved, when Duncan dies, as he is moved to the ambulance. In S9 E10, Josh returns to ambulance work, with a new partner, Liz. Their first call is to a fight at a rugby match. In S10 E3, Liz is held knifepoint by a clinically depressed man. Josh delays calling the police to try and talk to him. The man tries to molest Liz; she feels betrayed by Josh. And in S10 E7, Josh and Liz have to search frantically for a baby, who was kidnapped by a suicidal woman, who’s own baby died. In S10 E16, there is a bogus paramedic on the loose. Josh and Liz are appalled to discover that an boy is critically ill, after the paramedic injects him with adrenalin, and it was a call out they were given an inaccurate location for. In S11 E3, Mike Barratt and Charlie go out by helicopter to perform an emergency operation on a mountain ledge. Josh, scheduled for a place on the helicopter scheme, is pleased with the success of this latest helicopter operation. Next episode he has to deal with a violent drug addict, they alert the police as he searches for drugs. In S11 E7, Josh and Liz rescue a girl involved in an accident in the middle of nowhere. Mike talks Josh through doing a chest drain by telephone, however back in resus the girl dies. And in S11 E9, Josh and Liz rescue two girls by helicopter, after their caravan crashes. In S11 E20, Josh and Liz get an emergency call out to a fire at Josh’s address. His wife and son die, and they rush his daughter to A&E, where staff battle to save her, but fail. Josh is devastated. Next episode, although off work, he comes in to ask Baz how much pain they would have suffered. Baz tries to comfort him. In S11 E22, he returns to work, although Liz is unsure if he is ready. In S11 E24, after Jude’s stabbing, Josh is extremely shaky when called out to a man with a clot in his leg. He loses his temper, and Liz later confronts him, saying she thinks he needs counselling. Josh breaks down. In S12 E1, Josh helps delivers a baby in his ambulance. In S12 E12, it’s Liz’s last day, which Josh finds hard to accept. It is only when Liz puts her life on the line to save a woman and her son from almost certain death at the hands of a violently possessive husband that Josh realises he must let go and allow Liz to move on. in S12 E16, Josh risks life and limb to rescue a boy called Liam from a fire. His father dies, and his fiancée thinks Liam started the fire deliberately. Josh, only too aware of being left alone as a result of fire, forms a close bond with Liam and promises to look out for him. In S12 E19, Penny is disapproving of Josh’s intent to help Liam. In S12 E21, unhappy Liam tries to get Josh’s attention with 999 hoax calls. Despite his anger, Josh agrees to arrange a 5-a-side football match to raise money for the children’s home. The charity match in S12 E23 is a success, but they do not make up all the money; Josh quietly makes up the difference. In S12 E24, Liam gives Josh an adoption leaflet. Penny reveals her understanding, as she was fostered herself, but tells Josh he must put things straight with Liam. In S13 E6, a teenager Eugene is discharged by Sean, while Josh is at the bookies he discovers Eugene, having a cardiac arrest. Josh and Penny take him in, but he dies. Josh is showing signs of problems when in S13 E11, he asks Duffy for a loan. In S13 E15, Josh is upset when his date stands him up. Josh is found to have a gambling problem, and in S13 E20, Penny is pleased when Josh phones Gamblers Anonymous for help, in S13 E23 Penny drives him to his first meeting. In S13 E24, Josh and Penny arrive at a housing estate, due to close, to help two teenagers, Becky and David. Becky is trapped under rubble, and as David goes to an ambulance, the floor collapses, taking Josh, Penny and Becky with it, trapping them underground. Eventually the fire brigade manages to save them. In S13 E27, after a bank raid goes wrong, Josh, along with George, are taken hostage. They are found next episode, in woodlands, safe and well. In S14 E1, a boat carrying radioactive waste crashes into a harbour wall, Josh and Penny arrive to help; Penny falls in and Josh looks on in horror. Penny is saved next episode by a diver. In S14 E7, Penny finds another paramedic Mike moonlighting as a taxi driver; Josh confronts him. Later they are called to an RTA and are horrified to discover the victim is Mike, who later dies. In S14 E9, a film crew are shadowing Josh and Penny. Amongst their calls, include a man who dies at his 50th birthday; his son angrily tries to attack Josh. In S14 E16, Josh and Penny carry out a daring rescue after a woman drives her car off a cliff. In S14 E17, they are called out to a remote farmhouse, where a man has suffered a hypoglycemic attack. Not only do they find they have no drugs, but they have trouble starting the ambulance. In S14 E19, another bogus paramedic is causing havoc. He causes a mum in a shopping centre’s condition to worsen by injecting her with penicillin. Josh and Penny arrive, while the man is still there, and call the police. In S15 E5, Josh and Mel are called to a quarry, where a teenager has fallen. A landslide engulfs both Josh and the teenager’s cousin Mikey, next episode we learn they have survived. In S15 E8 Josh and Fin are called out to a farmhouse where a councillor has been stabbed. His wife and son tell them an intruder was responsible, but they soon realise it was the son after years of abuse the councilor caused his wife. In S15 E9, Patrick spends a shift with Josh and Fin, and learns a lot about the job of a paramedic. One of their patients being an old man who dies in an RTA. In S15 E22, Josh and Penny face a difficult situation, when they are called to a multi storey where a man has sustained nasty injuries after a fall. His brother, who pushed him, threatens to jump if he dies – but won’t let him go to hospital. Josh and Penny try to convince him he is still alive, and is later arrested. In S15 E23, Josh and other staff are en-route to another hospital when a teenager rushes out infront of them causing them to crash. He tells Josh is partner has gone into labour. Josh stays with the patient in the ambulance who later dies, while Fin is forced to deliver a baby. Josh and nurse Colette become attracted to eachother, and Penny is worried about Josh getting hurt. Their relationship is slow to take off when one date is interrupted by her interfering mother, and at the end of the series when Colette is forced to come clean about her estranged daughter. In S16 E1, Josh is driving to a call out, jumping a red light, he crashes with a car and the ambulance is left hanging precariously over a railway bridge. Fin and new tecnician Nikki manage to clamber out, but Josh’s foot is stuck and is luckily plucked to safety only moments before the ambulance plunges onto the railway track. The teenager, Danny, in the other car dies, Josh is shell shocked. Nikki believes he was driving too fast, and the police are called to take statements. Next episode, Sergeant Rachel James questions Josh about the accident, but despite provocation he gives little away. Nikki, Fin and their boss Jeff are all questioned, and Josh is given time off and removed from driving duties. Josh confronts the dead teenager’s sister, who is furious when she finds out the truth involving the circumstances of his death. In S16 E6, Josh attends an inquest into Danny’s death. Under cross-examination, Josh cracks and admits he feels guilty about what happened and that he must have been driving carelessly. The jury give a verdict of ‘Accidental Death’, but outside the court, he says he can no longer wear his uniform with pride and offers his resignation. In S16 E9, Josh is on sick leave, carrying out his notice. He spends his time doing DIY, and out side a hardware store, helps a young woman, Joanna, fix her car. Later he goes in to hand his uniform in, and is persuaded by Nikki to come to work, as they are short staffed. Reluctantly, he agrees and they go to a shout of a car crash, where he is shocked to find it’s Joanna. She is unable to be saved, but Josh stays with her till the very end, talking to her and she thanks him, before dying. He tells Colette it has made him to decide to return to work. Next episode, he thanks Colette for helping to persuade him to go back. In S16 E13, Josh steps in when a father threatens Colette in the relatives room – he later proposes to her outside of A&E, and she accepts. In S16 E14, on the eve of Josh and Colette’s wedding, while Colette spends a civil evening at a restaurant with friends – Josh is left tied to a lamp post in his boxer shorts. The next day, their wedding is forced to be put on hold when Colette’s estranged daughter suffers complications during labour. In S16 E15, Josh is beginning to think his relationship with Colette is cursed, while Charlie sets on a surprise mission to get them married in the hospital that day. Problems occur when the vicar is delayed and Duffy discovers that a man in reception dressed as a vicar is not a real vicar. Eventually the real vicar shows up and carries out the ceremony before the couple are whisked off on honeymoon. In S16 E25, Josh and Comfort are called to an obese man with suspected stomach pains. Josh believes him to be faking, as he has previously been taken to A&E only to make a miraculous discover – just so as to get a lift to his social club nearby. Josh ends up teaching him a lesson by planning to give him an enema and the man admits finally admits nothing is wrong with him. Josh is also involved in a near-disaster, when him and Comfort discover a man in their ambulance is an arsonist. In S16 E27, Josh is in A&E to undergo some refresher training. Colette is amused when he has to help a patient with urine retention. In S16 E39, Josh tells Nikki in her appraisal that she’s not pulling her weight. Upset she plans her resignation, but Josh rips up her notice, saying he won’t let her go that easily. Next episode she tries to take initiative on a case which ends up in her being stabbed. He blames himself. In S17 E1, three months after Nikki’s stabbing, Josh tells Nikki of Jack’s spontaneous marriage proposal at her bedside. They are also called to the derelict building, where she was injured, which brings back memories. In S7 E3, Josh and Nikki take a call to an angina sufferer, who is stuck in a freezer. Nikki wants to use a procedure that Josh feels is too risky. He gives in, but the patient’s condition worsen, which they end up realising was due to a different problem. Josh and Colette also discuss their recent marriage difficulties. In S17 E4, Josh and Fin take a call to a woman who has hurt her ankle. As they carry her down many flights of stairs, Josh nearly loses his balance and is upset when Fin calls for back up. He is also less than happy when he catches Simon and Colette practising dance moves. In S17 E7, Josh is still frosty towards Colette and is angered after Simon confronts him after Colette has discussed their marriage problems with him. Next episode, he is still annoyed and also discusses his health fears with Fin. Josh is also hit by a road rage driver and a teenager, who pretends to have taken an overdose, confides in him. In S17 E9, Josh goes to the medical centre and discovers he is suffering the male menopause. Colette finds out from Fin and is relieved at his predicament. In S17 E11, Josh asks Colette about starting a family, she is not happy at his suggestion. On a shout, Josh witnesses a car roll into the river with a child onboard. He dives into the river to save the boy. In S17 E12, problems are still rife between Colette and Josh, since he asked about starting a family. He confides in Charlie. He is also annoyed when Nikki carries out a procedure she is not allowed to do as a technician, but covers for her. In S17 E13, Josh gets involved in a case where a father has lost his wife and two children. Meanwhile, Colette takes Simon to a charity auction instead. Josh picks her up as she is about to go for drinks with him. In S17 E15, Colette is disillusions when Josh again fails to turn up, this time for the Christmas party. She ends up sleeping with Simon. Meanwhile, Josh has become trapped in a car with a mentally ill man – which ends up crashing outside A&E. He escapes just before the car explodes. In S17 E17, a guilty Colette, who had previously confided in Comfort that her marriage was over – tells Josh she is leaving him. He’s heartbroken and shocked. In S17 E26, Josh takes over as Operational Duty Manager. One of his first tasks is to take control of a situation where colleagues of a retired doctor who has collapsed has prevented Fin from being able to treat him. In S17 E28, Josh discovers Colette is pregnant (but not that it is not his). He is ecstatic but she is adamant nothing has changed between them. In S17 E36, Colette awaits test results to find out about her baby’s abnormalities. Josh arrives, just as the doctor tells them that neither of them carry the abnormal gene. Bitterly upset, Josh leaves and ends up throwing all her belongings in the street. In S17 E37, Josh bursts in on a conversation between Colette and Simon and an argument erupts. Later, Colette suffers stomach pains and loses her baby – Josh decides to be by her side. Next episode, Colette decides to leave A&E as she is unable to work with both Josh and Simon. Comfort tries to reconcile Josh and Colette. He overcomes his pride to tell her he still loves her, but she says it’s too late and she can’t forgive herself for what she has put him through. As she leaves, Josh pays Simon a visit to tell him he will ruin his life at the first opportunity. In S17 E39, Josh is displeased with Simon’s treatment of a boy at a crash scene. He speaks to Harry about Simon’s incompetence, while Simon is convinced he is just out for revenge. In S18 E1, After a train crash disaster, fire chief Mike Bateman and Josh take care of the situation as ambulance and buses arrive at the embankment. In S18 E4, Comfort is not dealing with the emotional aftermath of the train crash very well. Eventually, she admits to Josh that her experiences at the crash are affecting her work and he signs her off. In S18 E5, Lara and Luke are attending a photo shoot for the launch of the RRU (Rapid Response Unit) when they are interrupted by a call out to a road accident. They disagree about how the situation should be handled but the decision is taken out of their hands when they are called to another incident. Lara is aggrieved at leaving the woman casualty but promises her that she will be safe in Josh’s capable hands. But Lara is furious when Josh’s decision appears to have caused more damage. Despite having just received divorce proceedings from Colette, Josh calms Lara down with his normal professionalism and explains his decision. In S18 E6, when Josh learns that Colette has moved on, he and Charlie go AWOL for the afternoon. Friends for 16 years, the two reminisce over a pint and Josh tries his hand at karaoke. In S18 E9, Josh is ready to start photographing for the calendar and is speechless when Nikki takes off her top, positioning the defibrillator pads over her breasts. Other staff create similarly raunchy poses until Lord Lichfield offers to shoot the pictures himself. Josh graciously admits that professional ones would be better. In S18 E12, Jim is in an ecstatic mood – Nikki has accepted his proposal after a heart-to-heart with Josh. In S18 E31, as Josh and Luke are leaving a bogus call, a man, Greg appears from the back of the ambulance, holding a gun and demanding the key to the drugs box. In the ensuing struggle, Greg is shot in the stomach. In S18 E32, Josh has to suspend Luke pending the enquiry and inquest into the gun incident. Josh assures Luke it is standard procedure but Luke is unable to fully believe this. In S18 E37, Nikki, Josh and Lara are caught up in a robbery at a jewellers. In S18 E39, it is the day of Luke’s inquest. Josh sticks to his story and claims that drug addict Greg was holding the gun before it went off. The coroner returns a verdict of accidental death. In S18 E41, Josh’s date with Caroline turns into a disaster when he forgets to turn the bathroom tap off and the ceiling collapses on them. Comfort and Nina arrive at the scene and Nina is rude to Josh before she realises he is her boss. Josh is upset when Caroline leaves and it’s obvious she will not be back. In S18 E42, Josh is miserable after last week’s disastrous date. When Caroline brings him a present, he asks her for another night out. She declines and says she does not think he is ready for a relationship at the moment. In S18 E43, Comfort tells Josh about Nina’s rule-breaking last week. Josh reprimands Nina, telling her she must work as part of the team. Josh is staying in a noisy B&B and finding it hard to sleep. When Jim tells Josh he can stay with him, Josh is grateful and says he will be there no more than a week. In S18 E44, the puppy Jim ordered for his daughter’s birthday arrives a day early. With no-one to look after it, Jim is forced to take the puppy into work and leaves it in an empty room all day. Josh and Nina later find the puppy unconscious – it has choked on some tissue. Nina helps Josh to save it and the two decide to put their differences aside. In S19 E7, Kate’s boyfriend turns up at work and threatens Luke, pushing him to the ground. Josh scares him off but warns Luke to stay away from Kate, or he could end up getting hurt. In S19 E8, Fin is still missing and Comfort is frantic with worry. When a patient leaves his jacket in Josh’s ambulance he finds Fin’s penknife in a pocket; the boy says he found it near the railway line. Comfort overhears Josh telling the police and insists that they go there. A number of police cars arrive at the scene, who tell Comfort they have found a body that matches Fin’s description. In S19 E14, Luke and Nina are called to attend a man who is trapped in a sauna, it transpires that he is Woody – the new paramedic due to start on that day. Caroline from Orthopaedics comes down with clothes for Woody – she is his mother. Josh gives Woody a warning for not turning up to work. Caroline, who previously went on a date with Josh, asks not to be too harsh on him. In S19 E20, Comfort’s suffers stomach pains and Tess rushes her to Harry. Josh arrives at the hospital after Sam tells him Comforts’ news. Josh is angry at Tess for not telling him Comfort was pregnant. She loses the baby. In S19 E27, the episode focuses on Josh and his team as they go about their day’s work. Amongst the emergencies include a jet ski crashing into scaffolding at Holby Docks. An elderly man, Arthur, has his legs trapped under the boat. His wife, Sheila, is inside and, endangering his own life, he demands a paramedic go inside the boat to check she is safe. Nina finds her having an MI. Josh has no alternative but to order technician Nina to administers drugs to Sheila. It is the first time she has done this and Josh talks her through it from outside the building they are trapped in. Nina is nervous about doing it but does and saves the womans life. However, when they eventually release Arthur from the boat, his condition deteriorates and he dies. In S19 E39, Josh is called to a house to treat a baby that is unwell. Whilst holding baby Abby he trips and falls. Abby is rushed to hospital but dies. The parents, Martin and Lynsey, blame Josh for killing Abby. Josh worries to Maggie that he harmed Abby but Maggie tells him there were no signs of injury. An investigation into Josh’s conduct begins. Martin confronts Josh, calling him a killer but then admits he had been drinking and had taken Abby to bed. When he awoke he realised he had smothered her. Josh is relieved to know it was not his fault. In S19 E42, Josh and Charlie are held hostage by a man whose wife has been attacked. In S20 E6, Josh is observing in the ED as part of his paramedic refresher course. An elderly lady, Louise, is brought in after suffering a stroke. Her husband, George, is devestated when she dies and is adamant that no post mortem should be carried out. Josh misinforms him that this won’t be a problem. In S20 E7, Josh investigates the ladies toilets after complaints of a foul smell. He discovers the body of a dead woman, who’s been there for many hours. Josh is upset that no-one is made to be responsible for the incident. In S20 E8, Josh is furious with Woody for letting young boy Matt take a ride in the ambulance. In S20 E9a, the paramedics are giving a demonstration at the local school. A girl is injured when someone puts acid in the ‘bobbing apple’ water. As the paramedics battle to save her, Josh’s patience with the unruly kids snaps and he lashes out at a boy who has stumbled into him. Woody is not happy about the incident. As the story continues in S20 E9b, Josh gives chase to youths who have hijacked the ambulance whilst Luke tells Josh that the paramedics will support him following the incident involving slapping a schoolboy. In S20 E10, The father of the boy Josh hit at the school, comes to confront him to hear his side of the story. He then goes away to consider his next move and at the end of shift tells Josh that they will not be taking the matter further. All the paramedics are happy for Josh except Woody, who threatens to make a complaint about Josh himself. In S20 E11, tensions mount between Woody and Josh as Woody. They eventually sort things after Josh injures himself trying to rescue a man from a car. After talking, Josh convinces Woody he must get a DNA test to find out if he really is a father of Matt. In S20 E27, Josh has to come to Charlie’s rescue when he lands himself in trouble with an angry pimp on the streets as he hands out leaflets. In S20 E30, the paramedics are on standby at a local marathon. Josh has to teach Nina the disciplines if she wants to become a paramedic. In S20 E38, Luke informs Josh he’s resigning following the shoot-out. In S20 E40, Josh comends new paramedic Greg on his first shift. In S20 E46, Josh suspends Nina following her assault on a former patient. In S20 E47, Nina tells Josh she will resign. During a shout to a barn fire – Nina follows Josh to the scene and assists. Trapped in the barn with a young boy, Josh gives Nina instructions on how to carry out a procedure on the injured boy. Nina is hailed a hero but sticks with her decision to quit her job. In S21 E3, new paramedics Dixie and Cyd arrive and Josh is unimpressed by their laid-back attitude. When Dixie criticises Josh’s management, he decides to break the two of them up. In S21 E4, the rota for the paramedics has been changed behind Josh’s back so that Dixie and Cyd are back in a team together. Josh is unimpressed by the effort to undermine him and partners Dixie with himself. Over the course of the day the relationship improves. In S21 E8, Josh is due to attend an awards ceremony to mark his 20 years of service. But when a string of events makes him question society’s values, his decision whether or not to collect his much-deserved award hangs in the balance. He eventually decides to accept the award. In S21 E11, Josh is hard on himself when he makes a mistake with a patient at the scene of a club fight. In S21 E12, Josh tends to a rescue where a homeless woman has become trapped at a cafe. Meanwhile Josh agrees to look after Louis for Charlie, however Louis is a handful. After an argument, he falls over and cuts his face. Josh tries to help him but spiteful Louis lies to Charlie, saying that Josh hit him. In S21 E13, a protective mother, Laura, makes a complaint about him for dismissing anything being wrong with her child. Josh turns to Charlie for support but he ignores him – he’s still angry because he believes that Josh hit Louis. In S21 E14, Josh continues to isolate himself from the rest of the staff by being short-tempered with everyone. Later, Louis visits Charlie at the hospital and runs into Josh. The two men argue because Josh refuses to apologise for hitting Louis. Harsh words are exchanged and Charlie tells Josh to leave. In S21 E15, Josh’s world is crumbling around him and, feeling that he has nothing to lose, he puts his life, and that of his colleagues, in danger when he attempts to rescue a mother who has fallen into a frozen lake. Meanwhile Laura returns to the department with her daughter. Josh is still suspicious of her and she is later diagnosed with Munchausens Syndrome – but not before she’s stabs Josh in the back of an ambulance and leaves him for dead. Nathan finds him in S21 E16 and alerts the team who battle to save him. Louis confesses to Charlie that Josh didn’t infact hit him after all and the day also ends with Ellen being killed by a motorbike whilst searching for Laura. In S21 E17, staff members attend Ellen’s funeral. Josh, who has been signed off work for 6 months, also attends and angrily blames Harry for Ellen’s death and the hospital’s demise. Charlie later persuades Josh to do something pro-active in his time off, like travelling. S7 E2 – Off duty Josh comes across an RTA when an interfering GP jeopardises the patient’s condition. S11 E20 – Josh faces turmoil after the death of his family in a house fire. S16 E1 – After jumping a red light, Josh crashes an ambulance, leading to the death of a teenager. S16 E15 – Josh and Colette get married. S17 E36 – Josh is gutted when he finds out Colette is not carrying his child. S18 E6 – Charlie and Josh spend the day reminiscing. S18 E31 – Josh and Luke deal with a gunman. S18 E41 – Josh has a disastrous date. S19 E27 – Episode focuses on Josh and the paramedics. S19 E39 – Josh is first to be blamed for the death of a small baby. S21 E8 – Josh accepts recognition for 20 years of service. S21 E15 – Josh is stabbed in the back of an ambulance.